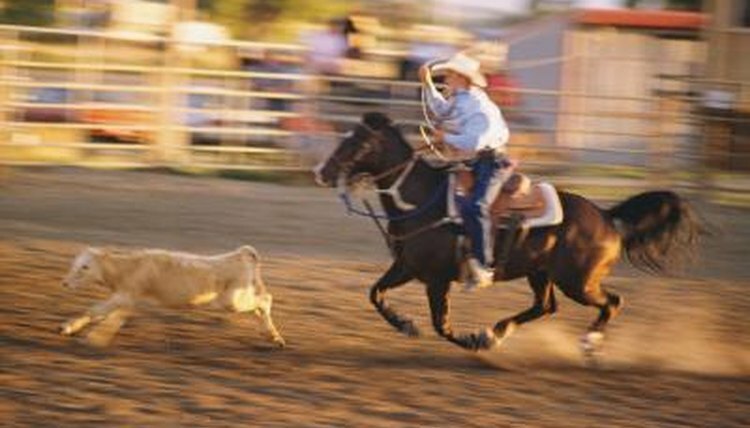 A roping saddle is useful either for ranch work or in heading and heeling competitions in rodeos. This type of saddle is heavy, has a low cantle or rear of the seat, and a sturdy, short tree with a thick saddle horn. Wrapping a saddle horn with rubber dally wrap protects the horn and tree from excessive stress when roping larger cattle and prevents the rope from slipping around a saddle horn. Place your roping saddle on a sturdy saddle stand. Center the seat on the center of the stand as when you place it on your horse. Fasten the front cinch around the saddle stand to hold the saddle steady and in place. Place a pair of pliers in your pocket or in a convenient area near the saddle. Pick up a rubber dally wrap and hold it with both hands. Rubber dally wraps are a continuous circle of flat rubber. Stretch both hands outward and twist them to limber the rubber for attachment to your saddle horn. Stand in front of the saddle and place the dally wrap over the saddle horn’s back at the bottom. The dally wrap should be flat on the bottom near the fork. Stretch the dally wrap very tightly toward you with both hands. Pass one hand over the other to twist the rubber 180 degrees. Keep firm pressure on the wrap with both hands and bring the excess of the circle over the saddle horn. Walk to the other side of the saddle horn and position the rubber flat on top of the first wrap with an overlap of about 1 inch. Twist the rubber wrap 180 degrees and pass it over the saddle horn to the front. Continue wrapping the rubber in the same manner from front to back and twisting until it is very tight. Place a pair of pliers on the dally wrap to obtain extra leverage to pull it over the saddle horn on the last wrap.  Keep each wrap on the saddle horn as flat as possible for best results in dallying.  Black dally rubber leaves black marks on ropes and transfers to your hands or gloves. You can choose from several other colors that do not discolor your gear.